First, a little background. 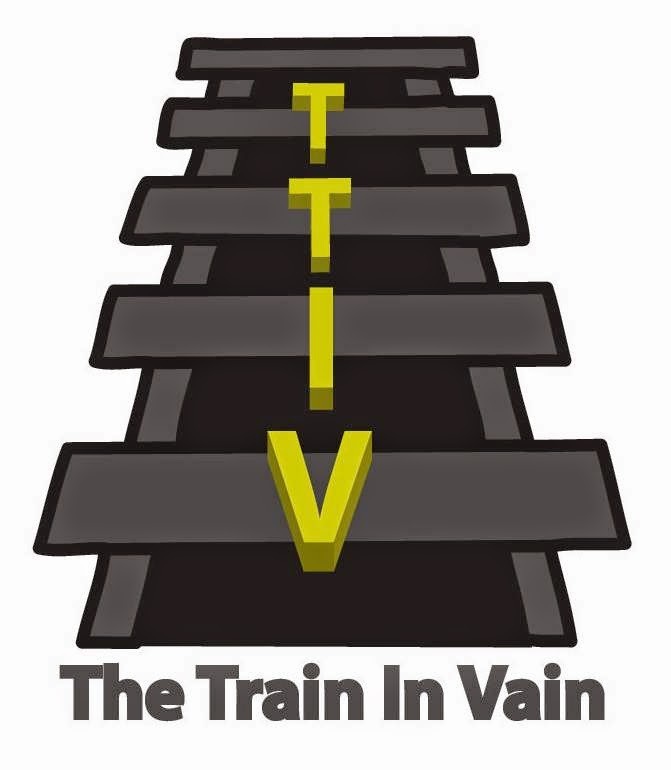 Standard train cars have repeating rows of three seats, an aisle, and a two seater. Half the seats face one direction, and the other half face the other way. 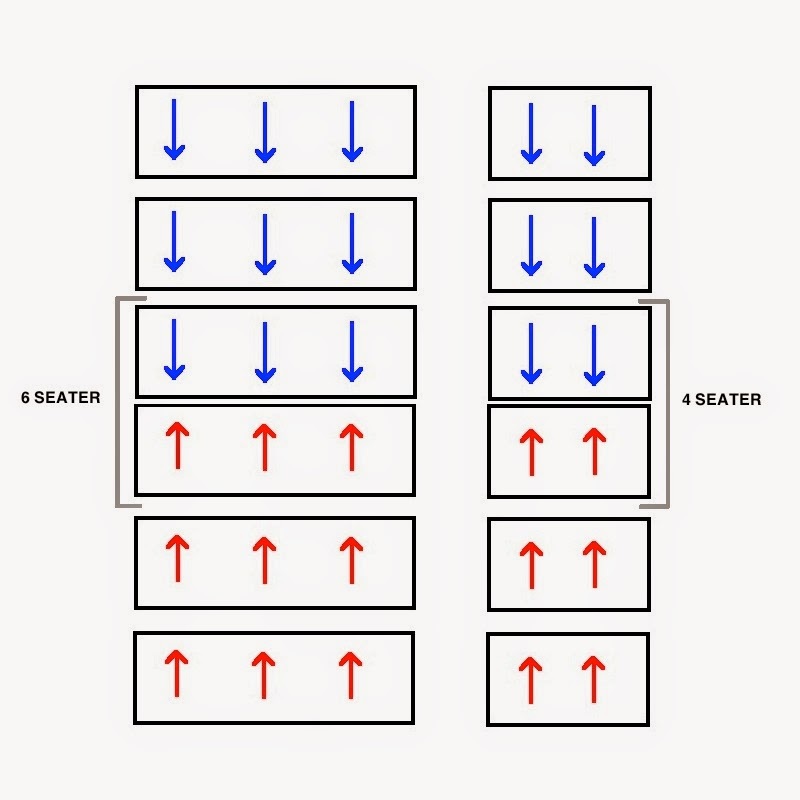 In the middle of the car, these two sets of rows converge, and you have a six seater on the three-seater side, and a four-seater on the two-seater side. I was in the four seater, where there were two of us. 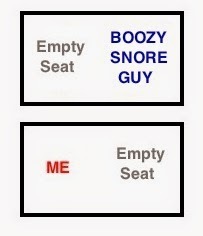 See the picture captioned "Seating arrangement." The other guy was tired, and he communicated this fact to everyone in the Tri-State area by snoring. Wow, was he snoring. Sleep apnea for certain. It was so loud that he jolted himself awake several times. I felt bad for him. A friend of mine snores like this. For my bachelor party, my friends and I went to Las Vegas for the long awaited Model Airplanes and Poetry Convention*. This friend and I shared a hotel room. He told me I'd need earplugs, and handed me a pair of the orange mushy kind they give you on planes. I laughed and said, "come on man, are you serious?" He was. He snored like nothing I’d ever heard. Later that night, I murdered him. No wait! I recant my confession. It was an accident! He suffocated himself with a pillow! Ok, I’m kidding. But he was absolutely right. I needed those earplugs, but just for the one night. I slept by the pool for the rest of the trip. Sorry, I’m reminiscing as I digress. I tend to do that. So back to the story. The guy across from me was sawing wood like a lumberjack on one of those History Channel shows. Do you know what I mean? On these shows, a bunch of burly and somewhat unstable men in plaid shirts take down entire forests in minutes. I don't get the fascination with these shows, but someone must be watching them. Ok I'm not digressing again. Staying on topic. We were across from each other, diagonally. He had a large bag next to him on his seat. At one point during the snore and jolt cycle, he woke up and looked around. I peered up from my book, and watched him reach into his bag. He took out a bottle of wine. He unscrewed the top, took a big swig, put the cap back on, and put the bottle back in the bag. It was 8:43 AM. Obviously, the man has a problem and I’m not going to make snide comments. What I will ponder though, is where was his discretion? 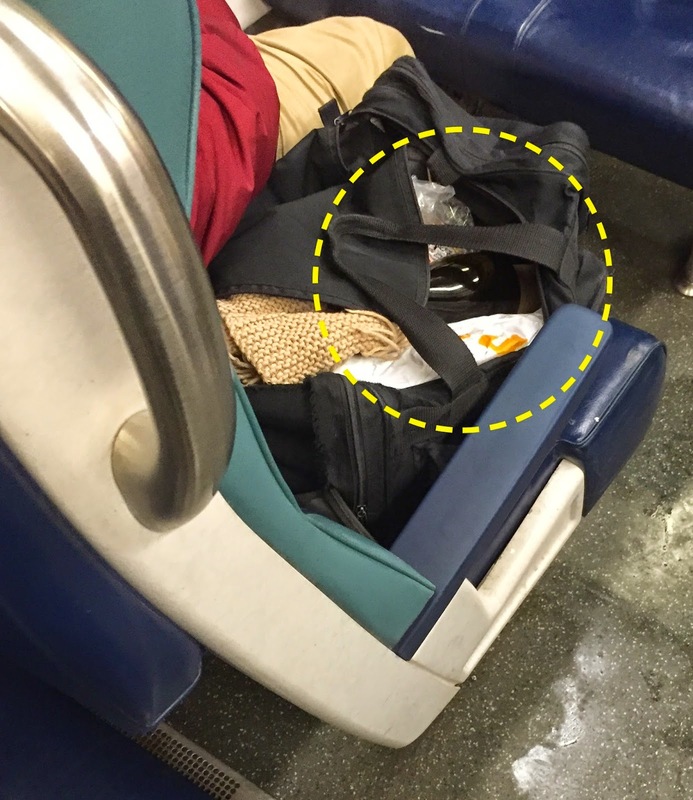 Couldn't he have at least concealed the wine in a sports bottle? This man had no interest in hiding what he was drinking. I've seen a lot on the train, but that was a first. He needs help. I hope he gets it. But perhaps I should give him the benefit of the doubt. Maybe he just got back from Afghanistan. At 9.5 hours ahead of New York, it would be past 5 o'clock, well into happy hour. Perhaps he was simply jet lagged? I wonder what odds Vegas would put on that. * What happens at the Poetry and Model Airplanes Convention stays at the Poetry and Model Airplanes Convention. That is sad. It's most likely that he simply has a problem and not that he just returned from Afghanistan. Quite sad. The things we see on the train. Yes, it really is sad. I do hope he gets help. It was a very sad thing to see someone so indiscreet about it.